Kings Will Dream will be set for the 2018 Caulfield Cup in the Spring after he recorded a dominant victory in the Ladbrokes Mornington Cup this afternoon. Kings Will Dream went into the Mornington Cup as a dominant favourite and it was a very easy watch for punters that took the short odds – he never looked like getting beaten. Dean Yendall gave Kings Will Dream a perfect ride in transit and the imported galloper responded very quickly when he was asked for an extra effort to race away from his rivals to record a five length win. Kings Will Dream has now recorded five wins on the trot since he arrived in Australia and trainer Darren Weir has been delighted with the way that he has progressed during his most-impressive campaign. “He is going well and he has had a great preparation,” Weir said. “He was strong through the line over 2400, which was great to see. “He got a beautiful ride and he was very strong through the line. “The preparation has turned out great, but when we went to the Benchmark 64 we didn’t think that we would win a Mornington Cup. “I think that it is great putting horses in races that they can win and you can still get into a nice handicap like this well in at the weights. “He could race on this campaign and there is no reason that he would have to go to the paddock, but it is job done now and he deserves his rest. 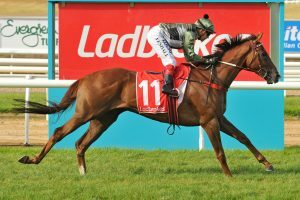 The winner of the Ladbrokes Mornington Cup receives ballot-exempt entry into the Caulfield Cup and Weir is sure to take advantage of that opportunity with Kings Will Dream.